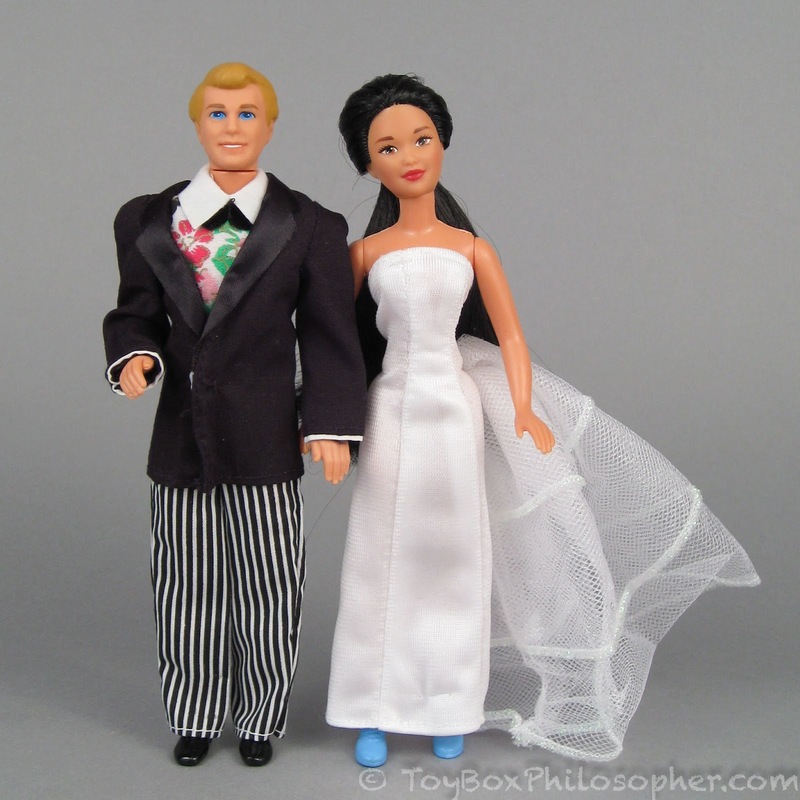 Sunday Monday Surprise: Bratz Secret Date! There were only about two minutes between the time I read an anonymous comment about Bratz Secret Date dolls and the moment I clicked "Buy it Now" on eBay. This is exactly the kind of toy that appeals to me (a vintage doll with a hidden surprise!) and I never even knew the line existed until I read that comment. So--although I can't thank you by name--many thanks to Anonymous for the outstanding suggestion! 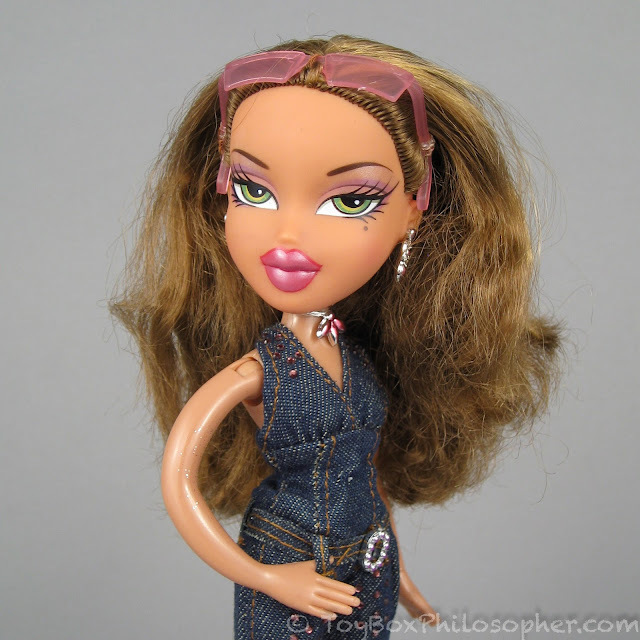 The Bratz Secret Date series was introduced in 2004. The collection included five of the Bratz girls (Meygan, Jade, Yasmin, Cloe, and Nevra), each packaged with a hidden blind date doll--one of five Bratz Boyz characters. Cool idea, right? The Secret Date collection ignited some controversy, though, because the title of the line and the suggestive commercial implied that the Bratz girls were going out in secret (without permission from their parents) with a boy they'd never met. In 2004, a time when concerns were brewing over kids meeting strangers online, the backlash to this series of dolls was understandable. I truly believe that the intention behind the theme was innocent--but that ad certainly makes me uncomfortable. What do you guys think? Bratz Secret Date Yasmin, 2004 ($29.99). I was looking around my studio the other day, trying to decide what to review next, and I realized that I have a lot of mini versions of 18-inch play dolls sitting around--some brand new, some that have been here for several months. The exact same day that I had this realization, I went to Walmart to buy grass seed (our yard is a lifeless mud pit), swung through the toy section...and spotted two of the new My Life As mini dolls. That's when it hit me that I should do a sequence of shorter reviews showcasing some of these newer minis--a mini series about mini dolls, if you will. My Life As a Baker mini doll ($9.88). Sunday Surprise: Family Corners by Mattel! Some of my favorite Sunday Surprise dolls have been vintage items that are older than my kids. The Jolly Dolly babies from Easter are a good example, as is one of my all-time favorite baby dolls: the Sweet e.Baby from 1999. I like these older dolls because they offer secrets that have been hidden for decades, but also because they give a fascinating glimpse into the history of dolls in our society. A few weeks ago I was talking about how Mattel has been making some modernizing changes to many of their doll lines. Today I will go back in time and show you how this company was doing things in the early 90s. The Family Corners dolls came out in 1994 and featured separately-sold male and female characters. Kids could match up their favorite couple, stage a wedding, and then reveal a hidden baby doll. I bought these dolls because of the secret baby (a fitting topic for Mother's Day...happy Mother's Day!) but what I actually find more interesting is how the presentation of this concept manages to be both socially restrictive...and also inspiringly open-minded. Family Corners "Nicholas" and "Trista" dolls (1994).